A new play reminds us our economy is still stacked against ethnic minority workers. These were the words of Jayaben Desai, leader of the Grunwick strikers, whose remarkable struggle for dignity, respect and rights at work between 1976 and 1978 has been captured in the new production ‘We Are The Lions, Mr Manager!’ Those words need repeating today. A terrific portrayal of the situation facing workers at the photo processing plant in Willesden, the play dramatically recounts the two year struggle led by Mrs Desai, in which Brent Trades Council, Jack Dromey, the Apex Trade Union and workers from across the UK stood in solidarity with the largely Asian workforce. The play has brought back into focus the workplace discrimination, indignity and inequality faced by migrant workers in Britain in the ’50s, ’60s and ’70s. 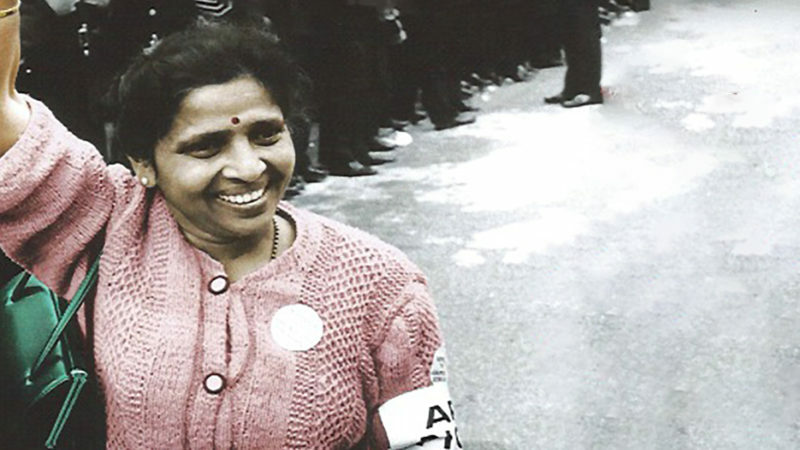 Yet forty years since Grunwick, little progress has been made in the rights afforded to workers ‘new to these shores’ – and the parallels are stark. Aggressive bosses failing to respect workers, compulsory overtime, productivity targets, agency workers not paid properly, and receiving punishment points for simple misdemeanours. This isn’t a throwback to a previous era, but something migrant workers experience regularly, and which James Bloodworth documented in his book recent book Hired. So eager are businesses such as Amazon to meet commercial targets, they have forgotten their corporate values to respect the predominantly migrant workers who work and walk several hours a day in their warehouses fulfilling customer orders. These minimum wage workers are employed under a precarious culture of fear. A fear of asking to go to the toilet, a fear of taking a full lunch break, a fear of refusing overtime, a fear of joining a union, and a fear of complaining about their working conditions. Many in this invisible community of migrant workers are working on forced zero hours contracts, and while they probably have little impact on the student working occasional holidays in a restaurant, they are felt greatest by the social carer with cancelled shifts who finds she can’t afford her weekly rent; the hospitality worker sent home early not knowing how much he will earn from one week to the next; and the warehouse worker who finds they can’t afford new school shoes for their kids. The fluctuating pay leads to financial insecurity, and any staff complaining quickly find that their employers slash their hours. The risk associated with zero hours contracts is all borne by the employee, while employers abscond all responsibility to their workers. The supposed flexibility only benefits employers, employees struggle to go elsewhere for work, have to be on standby at all times, and then can’t say no when the work does come. The very people who can’t afford the insecurity, have zero hours contracts forced on them, leaving them a savage form of disposable labour. ONS twice-yearly data published last week shows that there are 1.8m zero-hours contracts in the economy now, representing 6% of all employment contracts. We have seen an increase in their use by over 500% in the last decade, and there seems little appetite to mitigate the impact of them. The TUC have found that zero hours workers earn less than a third of average workers, and are concentrated amongst those already facing disadvantage in the labour market – part-time workers, women, the young, BAME workers. Just over one-quarter of people on a zero hours contract want more hours and two-thirds would prefer guaranteed hours contracts. When Wetherspoons offered their staff the opportunity to move onto guaranteed hours contracts, four in five opted to make the move. Other businesses must follow. Zero hours contracts are dominant in admin roles, the hospitality sector, construction, and health and social care. And now employees and trade unions need to urge more companies to move staff to guaranteed hours contracts with sick pay, redundancy pay and holiday pay entitlements. The Taylor Review of Modern Working Practices suggested that employees working on a zero hours contract should be able to request a minimum hours contract after 12 months – a timid proposal that will see employers continuing to exploit workers right up to their first anniversary of employment at which point they could be easily dismissed. It is only ending this unfair practice that we can give back workers the stability and security they demand. Employers have been using zero hours contracts to hire workers “on the cheap” because their hours could be cut without warning and it’s time to consign this practice to history. I’ve always been struck by the determination of Jayaben Desai. In the context of ending zero hours contracts, her words “Fight with courage, fight with passion, fight on”, are as relevant today to ending exploitative working practices as they were 40 years ago. The fight goes on. John Lehal is a business and voluntary sector adviser, charity trustee, mentor, and Labour Party activist. ‘We Are The Lions, Mr Manager!‘ is touring the UK now.